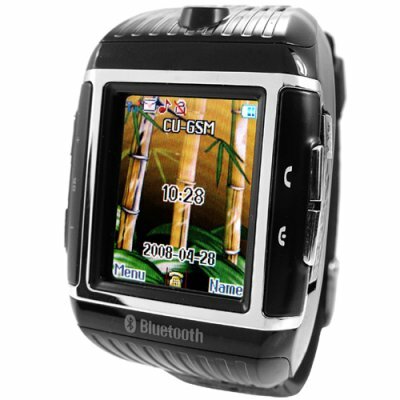 Successfully Added Quad-Band Cell Phone Watch - 1GB Water Resistant Mobile to your Shopping Cart. Great innovation in mobile phone watch technology; a four band GSM cellphone built into a high quality water resistant smart-tech watch. This is a fully functional unlocked GSM mobilephone with a color touchscreen, Bluetooth, and rich selection of multimedia functions. Calls are made with the supplied Bluetooth headset or simply use the built-in MIC and speaker to talk/listen directly from the phone. This is the latest in a great line of Chinese cell phone watches to be released this year, and in particular, this model is weatherproof and includes a long requested feature, quad-band technology! The watch's outer casing is made up of shock resistant polyurethane materials and the strap is a flexible but strong rubber blend. The watch uses either a touch screen or intuitive 5 button configuration for menu and function navigation. When in standby mode the face displays an attractive digital and analog clock as well as the date. Great for cyclists, commuters, and anyone who wants to stop carrying round bulky products in their pockets or backpack. This is a wonderful product for the internet storefront and re-sale markets. Sure to be a great seller, order in bulk now to secure your stock and get the best wholesale prices and save on shipping. Proudly brought to you by the leaders in wholesale direct from China electronics, Chinavasion. This is an unlocked quad-band cell phone multimedia wrist watch with Bluetooth earphones and a touchscreen. Has built in EMAIL, SMS, and MMS messaging features. Stylish black color watch having two batteries, 1 GB MicroSD card, all required cables and earphones + Bluetooth clip included. NOTE: This product is compatible with GSM at the frequencies of 850MHz, 900MHz, 1800MHz and 1900MHz. This can be used throughout the world. Resellers: Other names you can use for this product include "Cellphone Multimedia Watch", "Mobile phone entertainment wrist watch", "Cellular watch phone with MP4"
How do I turn the watch on? To power up the watch, please make sure a SIM card has been inserted and the battery is charged. The POWER or ON button is the HANGUP button on the right side of the watch. It's the lower of the two buttons. Give it press for a few seconds and the screen should light up. Just arrived today. Great phone with lot's of features. Looking forward more pleasure with this.